The machine base is fabricated from steel tubing and fitted with precision twin ball bushing rails for the carriage to travel upon. The spindles are mounted on precision machine tool slides providing accurate adjustment in .001″ increments. 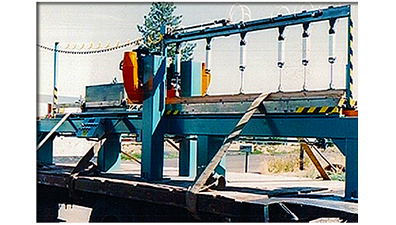 The back stop gauge bar is adjustable to provide stock centering on the carriage. The carriage is powered by a gear-motor through a variable frequency motor controller. The machine is controlled with an Allen Bradley SLC500 programmable controller. 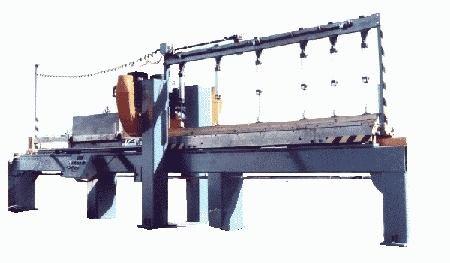 The machine has a head jointing attachment that is pneumatically lowered past the cutter head. 1.Production rate is about three batches per minute dependent upon personnel. 2. Maximum batch height is four inches, dependent upon your choice of cutter head width. 3. Maximum batch width is ten inches. 4. Minimum batch width is two and one half inches. 5. Maximum batch length is eight feet four inches. 6. Minimum batch length is two feet. 7. Spindles are belt driven with ten horsepower motors, and 1.813 inch diameter shafts. 8. Hydrolock cutter heads should have ten or twelve knives, and a cutting circle of nine inches minimum, and nine and one half inches maximum. 9. Dust pick up is through two each six inch outside diameter hood ports. 10. Compressed air at 100 psi will be used at a rate of 3 cfm. 11. Owner supplied electric service should be 480 vac, 60 hz, 50 amps. 12. The owner will supply top and bottom caul boards for each width of veneer to be sized.